In real estate, the term "Single Agency" indicates that a broker or agent will represent the interests of either the seller or the buyer. In other words, the agent will sit on only one side of the same transaction. The broker is either the listing agent or the buyer's agent. A single agency is the most commonly used form of real estate representation. A Dual Agency exists when a broker or agent represents both the buyer and the seller of a property. Dual Agency is forbidden in some locales. In a Dual Agency relationship, many advocates feel that neither the buyer nor the seller receive adequate representation. Under Single Agency, a broker representing a buyer is prohibited from showing the buyer properties listed by the broker's agency (in-house listings), without the buyer's express permission. If that buyer wants to purchase a property listed by the agency representing, and if the seller agrees, then it becomes a Dual Agency relationship. In parts of the country where Dual Agency is not allowed, some brokerages specialize, operating as exclusive buyer agents and do not work with sellers at all, or work exclusively with sellers. In most other types of agency relationships, the agent owes their client fiduciary duties of loyalty and obedience. Thus, if we are the buyer, we can expect the agent to place our interests ahead of their own, provide services with honesty and good faith, and avoid conflicts of interest. In some cases, real estate agents actually have no legal obligation to look after our best interests. Laws in 25 states now allow brokers to provide services to buyers and sellers as "transaction brokers" or "facilitators," without traditional fiduciary duties of loyalty and obedience. 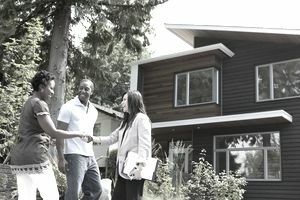 A transaction broker is the default role of a broker or agent; he or she does not represent the buyer or seller but instead acts as a neutral go-between to help both parties complete a home sale. Here, the broker is representing the transaction and acts as a neutral party. The transaction broker owes both parties limited confidentiality. That means that the transaction broker cannot tell the buyer that the seller would really agree to a lower price, or the selling that the buyer would go higher, without the expressed permission of the party in questions. Both buyer and seller are better served by Single Agency.